Our goal is to help you find the best equipment for YOUR game. Here's a list of commonly asked questions to help you understand the benefits of custom fit clubs and details about the process. How do I schedule a fit? We have clubfitters on-site every day, but in an effort to provide the proper amount of time and individual attention, we offer sessions by appointment only. Walk-ins will be accommodated on an open slot basis. Please send an email to Head Professional Monica Stratton or call the Carlsbad Golf Center pro shop to check appointment availability at 760-720 GOLF (4653). How long does a fitting session take? A custom fitting session can take anywhere from 15 minutes to 2 hours, depending on the number and type of clubs you are being fit for. See the time allocations on the fitting rate schedule or when you call the pro shop, discuss what you want and we'll let you know how much time to allocate for your fitting. Additionally, we suggest you come a few minutes before your scheduled appointment and we'll give you range balls so you can warm-up. Why should I be fit for clubs? Having clubs that are specifically fit to your unique, individual swing will help you hit the ball farther, straighter and more consistently. If the clubs you're currently using are inappropriate for your swing, an array of errant shots may arise. The wrong shaft length or flex may cause lack of distance, hooks or slices. Playing with the wrong lie will have an effect on your trajectory, or can cause pulls, pushes. The grip size can affect the way you hold the club, and may cause hooks or slices or too much tension in your hands. The wrong putter can wreak havoc on your scores and cause unnecessary frustration. What happens in a custom fitting session? In sessions for clubs other than putters, you'll test a variety of head styles and shaft flexes from different manufacturers, using face tape to indicate your points of impact for length and consistency of hit. We use the FlightScope launch monitor to compare individual club performance, calculate ball speed, launch angles, backspin rates and verify optimal ball flight based on what the golfer sees and feels, and what we see in determining the clubs with optimal performance. For putters, we'll measure your natural set-up to determine length and hosel styles that will work with your stance. Once everything is dialed in, you'll roll putts on our real-grass putting green to finalize a selection. We'll also fit you into the proper grip for your putter to ensure no unnecessary hand tension is caused by the grip. How do I know if I'm good enough to be custom fit for clubs? If you have, at a minimum, a somewhat repeatable swing, you can be custom fit for clubs or a putter. Many times people think they have to be a "good" player to deserve custom fit clubs. Actually, it's the opposite -- don't wait to be "good" because you may never get there without custom fit clubs. A highly-skilled player can compensate for ill-fit equipment better than a lesser-skilled player. In fact, it may be the equipment that is holding you back from reaching your potential. Many players see significant improvement in their game with new equipment or adjustments to their existing clubs. My swing can vary from day to day. How do you accommodate for that issue in club fitting? Club fitting is a process which helps to find clubs that make you more consistent no matter how you are swinging that day. All golfers have good and bad days, but their swing characteristics like swing speed and how they move through the hitting area don't vary much. Also, we have clubs for every type of golfer, so we can build in ultimate forgiveness in the club configuration to help the golfer improve and be more consistent with certain head designs, lofts and shafts. Will switching to new clubs drastically affect my game? Usually just for the better. Rarely do we see much of an adjustment period with new equipment, especially if it is fitted to the golfer. Most people immediately hit the ball better and putt better, but it depends on how much of a change it is from their prior clubs. We generally suggest allowing 2-3 weeks to get used to the new yardages and feel. Also, the best time to get fit is when you are hitting it well. In the end of the fitting process you get to decide what you want to do with your equipment. Aren't custom-fit clubs more expensive? Contrary to popular belief, it does NOT cost more to have clubs that are fit to you. Whether you choose in-stock or custom-made clubs, you'll get our 30-day guaranteed low price and we'll stay within your budget. CGC custom-fits many brands and price ranges of equipment for men and women so that we have something for everyone. Saving money on clubs is never a good reason to play the wrong equipment. Remember, we take trade-ins for your existing clubs to help you offset the cost of new ones. No. We order all custom clubs from various individual manufacturers. They will build them to your individual specifications and weight the clubs accordingly, which is better than making modifications to “stock” clubs. My current clubs are kind of old, is it worth looking at retro-fitting them or should I just buy a new set? The technology of most golf clubs is outdated after just a few seasons. If you want to take advantage of the latest technology, you should buy new clubs. If you think your old clubs are pretty good and could be modified slightly to be better, we can look at that during a fitting session. 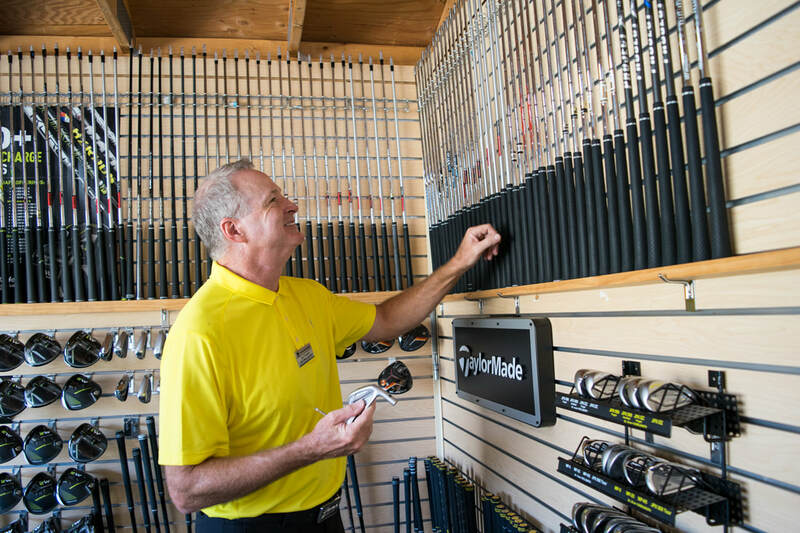 During the custom fitting process we start with your current equipment and can evaluate whether they are the best for you and if the specs are correct. If you would like to try the new irons and compare them it will be easy for you to tell if you can hit them better. We will be there to help guide you through the process, but will not push you to buy anything unless that is what you wish to do. I think my putter could be better, can you help me determine what changes would help me? Yes. Bring your putter to the shop and we'll check it against your stance and set-up. We'll also check that the grip is fit for your hands, as size and style can affect hand tension and how you hold the putter. Some people find success simply with a grip change, including trying an oversized grip. Other common putter alterations we can make are cut-downs, lengthening, adding weight, etc. to improve how it feels to you. Most of these alterations can quickly be done in our on-site club repair room. Please note that each alteration is priced separately and you may need to buy a new grip. I’m thinking of changing shafts from steel to graphite (or vice versa) with the same heads – will this work? We recommend you come in for a retro-fit so we can make sure the shafts you want to change to are what you need and which shaft is best for you. The heads for graphite clubs are heavier, so if we put steel shafts in the same head, usually the clubs will come out too heavy. There is a chance we can take some weight out of the heads, and also use a lightweight steel to get the right swing weights. We hope you'll be thrilled with your new equipment, but just in case you aren't we offer a 90-day happiness guarantee on all our custom fit club orders. Trust only those who are certified club fitters, such as the ones we have here at CGC. These professionals have been trained to collect and analyze data about individual swings and translate the information to proper specifications for customized clubs. Plus, most of our clubfitters are also golf instructors, so they can help make sure you have your best swing during a fit. Major manufacturers such as the ones CGC sells provide hours of training on each of their specific products and fitting systems. Why is club-testing better at a driving range? Unlike indoor stores where you hit directly into a net or putt on an artificial surface, testing clubs at a driving range like ours allows you to actually see where the ball goes in the air and test putters on a real-grass green. Ball flight results and the actual roll and break that happen on a real-grass green are extremely important in determining proper club fit. Many times it appears you've hit the ball straight, only to see it hook or fade before landing. You simply cannot see this hitting into a net or cage or putting on fake grass. We want you to have as many clubs as possible to test so that you can find the right clubs for your game. Not getting fit by a professional can be more expensive when you consider the money you might waste while “guessing” which clubs are right for you. It is extremely expensive for us to assemble all the fitting systems and demo clubs from so many manufacturers, as well as have a launch monitor and brand new golf balls to hit. Other places that fit for free are probably not offering as complete a process as we are or might not be “fitting” you at all -- especially if you can only test one or two brands or if you have to hit into a net. 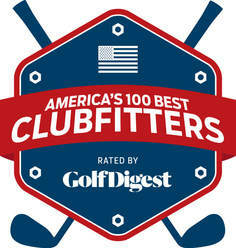 Additionally, we send our clubfitters to various training sessions so that they are certified by the manufacturers. In much the same way as if you took a lesson from one of our professionals, we have to pay them for their time and expertise. The major difference in being fit with us is you get to try lots of different brands at the same time and we are unbiased with which clubs you purchase. By having so many brands, we are able to fit you to what works best for your swing -- and most times it takes more than one brand to play your best. If you just want one brand, then coming here or going to the manufacturer are both great, but the fit will most likely cost you more if you go to the manufacturer. And, some of the manufacturers do not actually sell clubs at their fitting facilities and will send you to somewhere like our facility to buy them. A launch monitor is a computer that records the launch conditions of a golf ball at impact. It gives information on spin rate, launch angle, carry distance, etc. and allows us to statistically compare the results when you hit different clubs. It helps us target your correct club combination and to “gap” fit you with different lofted clubs to make sure you have all your distances covered. Our launch monitor is radar-based technology which can determine distances to within one yard, even though we are hitting balls into the hill on the range. For putting fits, we use the TOMI system, which captures the critical parameters of your putting stroke in real time. TOMI uses basic mechanics to measure alignment, rotation, path, loft, impact spot, and tempo, which all contribute to how a putt rolls and which can be improved with the right putter for the player. All brands may be fit for both men, women and some juniors depending on their ability and size. Our dedicated, on-the-teeline custom fitting building houses manufacturer fitting systems and demo clubs that allow us to configure clubs in a variety of shaft flexes and lengths, head styles and lofts, etc. for every type of player. Fitting fee rates include testing of as many of the brands within each category of club type that you wish to try. For example, if we have 13 different brands of irons, you can test all of them if your clubfitter believes it takes that many to narrow down to the ones you hit the best. However, often times we can narrow down options without testing everything. Yes. Your existing clubs will give us a baseline with which to compare the new clubs you are testing. This will help you understand the difference between older and newer technology. Additionally, we can look at your existing clubs to determine their trade-in value toward your new purchase even though you may keep those clubs until your new ones arrive. It depends on the club type and brand type, as some clubs can be modified, but others cannot due to the way they are constructed. The best time to be fit for clubs is BEFORE you buy, which takes the expensive guess work out of potentially buying the wrong clubs for you. Getting fit before you buy offers the maximum opportunity to correctly fit you in every aspect of the clubs. We may be able to affordably change to the correct grip size or bend to the right loft or lie angle. If, for example, you bought the wrong flex shaft, it could be expensive to change those out. Sometimes it is better to just trade-in incorrect clubs and start over with new ones. We would work with you in a RETRO-FITTING session to determine if the clubs you purchased are right for you. ​How do you fit really short or really tall players? ​What is the difference between “men’s” and “women’s” clubs? ​Not much. Men’s standard shaft length is typically 1” longer than women’s standard. Shafts labeled as “men’s” typically come in three flexes (stiff - S, regular - R and senior or “A”) while women’s typically come in just one flex (light or L). However, it is common for women to play with “men’s” flex shafts and, occasionally for men or junior boys to need “women’s” flex shafts. In drivers, women’s clubs often come with higher lofts than men’s to help get the ball in the air. Since golfers come in all heights and comfortably stand different distances from the ball, we can order shafts in different lengths from the factory where they will balance the weight of the head with the length of the shaft. ​What happens after a fit session and how long does it take to get my new clubs? You'll never be pressured to make a purchase. We keep your personal specifications until you're ready to make a decision. Even after you buy, we keep your specifications on file so that you can add or replace a club to your set at any time. If you choose in-stock clubs, you're out practicing on the range right away. Custom-made clubs are usually shipped within 7-10 days from order placement at the manufacturer, although sometimes it might take a bit longer and we will let you know how long just as soon as we find out.